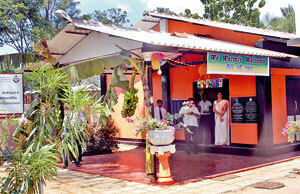 The Lakshman Kadirgamar Computer Training Centre, an initiative of the Lakshman Kadirgamar Foundation in collaboration with the National Vocational Training Authority was opened in Kilinochchi on March 21. Addressing the gathering at the opening ceremony, Dr. Hiranthi Wijemanne, Sri Lanka’s candidate to the UN Committee on the Rights of the Child said the children who would benefit from this centre were from poor and disadvantaged families, denied education with little power to overcome violent groups of adults who wanted to exploit them and deny them a future. “From 1983 to 2002, more than 60 per cent of the fighting cadres of the LTTE were children under the age of 18 and according to UN data bases from 2003 to 2009 over 6,000 children from Kilinochchi, Mullaitivu, Jaffna, Vavuniya and the Eastern Province were in the battlefield. Mr. Kadirgamar was moved and concerned about the children and youth, both boys and girls who were the worst victims of terrorism,” she said. Ms. Wijemanne added that the Lakshman Kadirgamar Foundation approached the Government of India and held discussions with the Indian High Commissioner Ashok Kantha, seeking assistance to open a computer centre for these young victims of war. Computers for the training centre were donated by the Indian government while Encyclopedia Britannica and Encyclopedia Encarta software for the computers were gifted by DMS Electronics. Youth Affairs and Skills Development Deputy Minister Duminda Dissanayake, V Mahalingam Consul General at the Indian High Commission Office in Jaffna, Suganthie Kadirgamar, wife of the late Foreign Minister Kadirgamar, Dr. Wijemanne and a member of the Lakshman Kadirgamar Foundation were present at the opening ceremony.